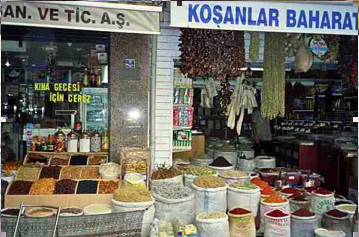 A super market would have pre-organized unfamiliar foods for me, provided a name for the foods, standardized a price -- not a familiar concept in Turkish bazaars -- and helped me do comparisons among products. Publishers provide an analogous service for information. And, higher education is a super market of knowledge, so it too pre-organizes unfamiliar and important knowledge for the uninitiated. A serious problem now is that the higher education supermarket is overwhelmed with super-abundance, not only in quantity but in velocity of exchange: If one dollar bill passes through 10 pairs of hands a day, the one dollar created ten dollars of value. If one piece of information is exchanged ten times a day, it may create ten new integrated concepts, or a thousand. We all experience the problem of abundance when a Google search produces 492,000 hits. Web 2.0 is the information bubble. A new business model characteristic of Web 2.0 is to scaffold a new business on the existing business of your partners. A new Web 2.0 site will run ads managed by Google and the revenue stream starts. It will import photos from Flickr and add social functions through Facebook. So, the current bubble is not the financial bubble that the Internet bubble was in the late 1990s, but is more an information bubble. To write of the "buzz" nowadays is to create a buzz within a buzz within a buzz. Talk about the field of infinite possibilities! The Semantic Web is one approach to de-fragmenting all these buzzes so we can make some sense of our searches. The Semantic Web provides us with a Resource Definition Framework (RDF) and a Web Ontology Language (OWL), which are just two of the projects as we attempt to improve search among the plethora of information bits. Instead of Universal Resource Locators (URLs), we now have Universal Resource Identifiers (URIs), for example. We can already locate too many resources; we need now to begin identifying those resources. Defining content artifacts as they are added to the Web, and defining them in a standardized way, helps us find a path through the Web 2.0 forest. An entire conference called Defrag (http://defragcon.com/2008/) addresses the issues of overwhelming abundance. The conference site says: "As online data is growing and fragmenting at an exponential pace, individuals, groups, and organizations are struggling to discover, assemble, organize, act on, and gather feedback from that data." Humans are much more experienced at dealing with scarcity than with abundance. Rarely in human history over millions of years has a large percentage of humans consistently had more of anything than they (we) needed. Yet, over just the past few decades, in many countries, humans are now dealing with a new problem, a super-abundance of things and, now, of information. The obvious next phase of Web 2.0, the Semantic Web, faces an enormous problem: overwhelming data that is mostly undistinguished. For a few years, organizations have been creating ontologies (semanticized digital repositories) from their data store. Internally, these organizations are re-establishing a rational search of their own growing numbers of online artifacts. When Can We Expect the Semantic Miracle? Will we suddenly start getting only 492 hits instead of 492,000 when we do a Google search? Not overnight. Web 2.0 technologies are learning and improving, but human intelligence is still needed to define knowledge and information domains and how new artifacts or data fit into those domains. The Semantic Web, after all, will not yet nor possibly will it ever supersede Web 2.0. The Semantic Web is more accurately seen, most likely, as a subset of Web 2.0, a more rationally searchable portion of Web 2.0, but only as part of the Web 2.0 revolution, not a new revolution.